Since the early days, OS X Server has supported performing the serveradmin commands through a web interface. This interface was accessible at the address of the server followed by a colon and then 311 in a web browser. This feature was disabled by default in Mountain Lion. But fear causes hesitation, and hesitation will cause your worst fears to come true, so we’re going to turn it back on here in Server 3. To enable, use the following command: sudo defaults write /Library/Preferences/com.apple.servermgrd requireUserAgent -bool false Once done, open https://127.0.0.1:311 in a web browser, or replace 127.0.0.1 with the address of the server if accessing from another location. This is stimulating, but we’re out of here. So, authenticate to be greeted with a list of services. 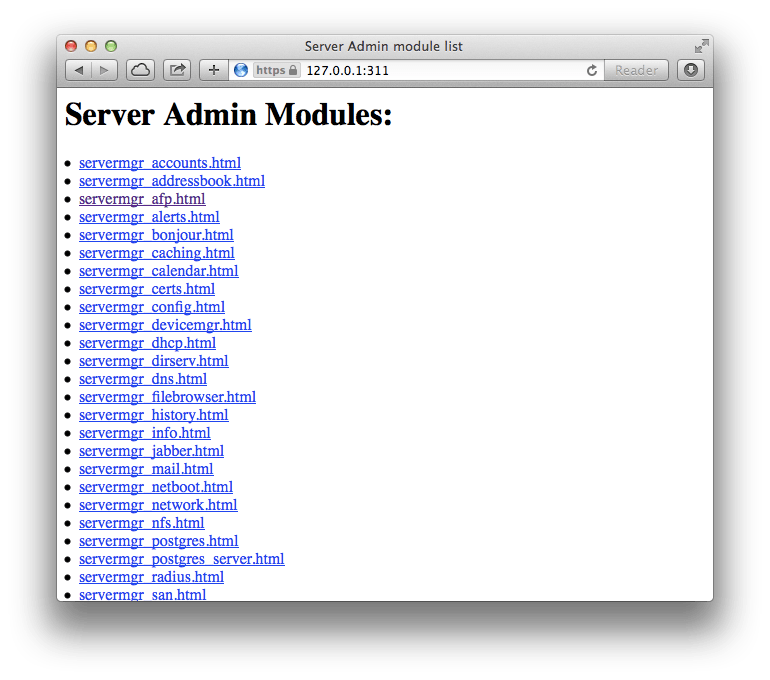 At the Server Admin Modules page, each service output from `serveradmin list` appears. Clicking each produces the ability to run the commands you can supply using `serveradmin command` along with the service name. For example, to get a list of all of the connected AFP users in OS X Mountain Lion Server, run the following command: sudo serveradmin command afp:command = getConnectedUsers Now, to get the same list, click on the servermgr_afp.html link and then click on getConnectedUsers. You then see an XML output that shows who’s connected (since I’m on a flight right now, luckily no one is connected to mine). Now you also have a URL in the toolbar, which should look something like this: https://127.0.0.1:311/commands/servermgr_afp?input=%3C%3Fxml+version%3D%221.0%22+encoding%3D%22UTF-8%22%3F%3E%0D%0A%3Cplist+version%3D%220.9%22%3E%0D%0A%3Cdict%3E%0D%0A%09%3Ckey%3Ecommand%3C%2Fkey%3E%0D%0A%09%3Cstring%3EgetConnectedUsers%3C%2Fstring%3E%0D%0A%3C%2Fdict%3E%0D%0A%3C%2Fplist%3E%0D%0A&send=Send+Command Rad, unicode. I guess spaces aren’t really compliant in URLs. Before we look at that, let’s take a look at what we can do with these. If you follow what I write, you have probably noticed that I use curl for tinkering with URLs a lot. In many cases, this is not the right tool. But I usually start there and move on if need be. Six seconds. We’re going to be meat waffles. Because we’re going to assume the server is using a self-signed cert that we don’t yet trust, we’re gonna’ use a -k along with curl. Then we’re going to follow that with the link. However, since we need to auth, we’re going to also go ahead and embed the username (in this case johhny) followed by a : and then the password (in this example, bodhi), followed by an @ in between the https:// and the server address, as follows: curl -k https://johhny:bodhi@127.0.0.1:311/commands/servermgr_afp?input=%3C%3Fxml+version%3D%221.0%22+encoding%3D%22UTF-8%22%3F%3E%0D%0A%3Cplist+version%3D%220.9%22%3E%0D%0A%3Cdict%3E%0D%0A%09%3Ckey%3Ecommand%3C%2Fkey%3E%0D%0A%09%3Cstring%3EgetConnectedUsers%3C%2Fstring%3E%0D%0A%3C%2Fdict%3E%0D%0A%3C%2Fplist%3E%0D%0A&send=Send+Command The output includes the afp:usersArray which shows active connections. The most interesting options, other than those for services you run in your environment, ar those under servermgr_info. Here, you can get PIDs for processes, kill PIDs, view logs, check file sizes, delete data and even reboot servers. Overall, this option has some security concerns, but provides some good insight into how the Server Admin tool worked under the hood in Mac OS X Lion Server and below while also serving as a functional option as an API for the product, especially given that output is in XML, similar to the output of most other modern APIs.